Mango has been diced into easy-to-eat pieces. Can be thawed halfway and eaten as a dessert, or used to make juices and shakes. We selected ripe mangos and diced them into easy-to-eat pieces. The mangoes were then frozen separately and conveniently packaged in ziplock bags, allowing you to take out just the portion you need without defrosting the whole package and to avoid the messy work of skinning the mango and cutting out the large central pit. 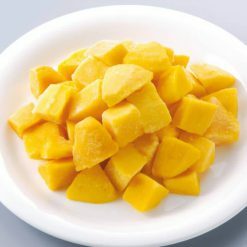 Our frozen mango can be eaten as a snack or dessert, and combines well with yogurt and with other fruit. Mangoes contain vitamins A and C, as well as some folate and some potassium. Sugarlady’s produce is harvested in season and then frozen immediately in order to ensure the highest possible nutritional value and best flavor, and remains vibrant and undamaged when frozen for long periods. Even if our mangoes remain frozen for months, once defrosted they will still have their lovely golden color. When half-thawed, the mango can be eaten as-is as a quick and easy dessert. Mango also makes a tasty ingredient in fruit salad, and a festive topping on waffles, yogurt, or even oatmeal. 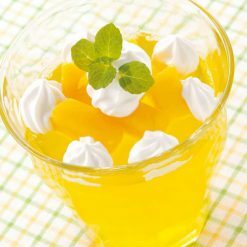 The mango can also be put into a mixer with things such as milk, yogurt, and honey and made into a delicious shake or juice. To make a mango yogurt shake, combine 250g frozen mango, 200mL milk, one 80g package of yogurt, and honey to taste in a mixer and blend. Once defrosted, the flesh of the mango will turn brown as time goes on, so we recommend eating it while it is still cold. This product contains mango (Thailand). Origin of ingredients: mango (Thailand). Prepared and packaged in Thailand.